20 year-old poker pro Harrison Gimbel was able to outlast some 300 other entrants to win the largest tournament in Florida history. Gimbel won the World Poker Tour/Fall Poker Open at the Seminole Hard Rock Hotel & Casino, worth an impressive $333,000 –the largest payout in Florida poker history. 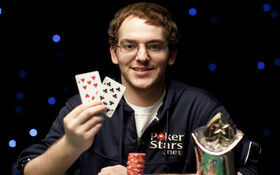 Gimbel, who is a familiar name to poker fans thanks to his win at the PokerStars PCA Championship in January where he booked a $2.2 million win at the age of 19, is a rising star in the poker world, and has amazingly won two major tournaments before his 21st birthday! Take that Annette Obrestad! Florida, and the Caribbean, allows players to participate in casino games at the age of 18; unlike most locales in the United States that stipulate a player must be 21 to enter a casino. Unfortunately for Gimbel he will miss out on next year’s World Series of Poker in Las Vegas since he doesn’t turn 21 until October. · In January 2010 he not only won the PCA Championship worth $2.2 million but also managed to take down a super-satellite to the event worth a further $10,300. For his career Gimbel has won over $2.6 million in live tournaments, not bad for a 20 year-old! This entry was posted on Wednesday, November 24th, 2010 at 7:11 am and is filed under Poker News. You can follow any responses to this entry through the RSS 2.0 feed. You can leave a response, or trackback from your own site.